It was the unblinking stare that caught my attention. I glanced up to see Chopin looking down with a cocky gaze that said, “You can’t resist this cuteness, can you?” He was right, of course. I dropped my sandwich, picked up a kitty toy, and began playtime with Chopin and his whiskered friends. 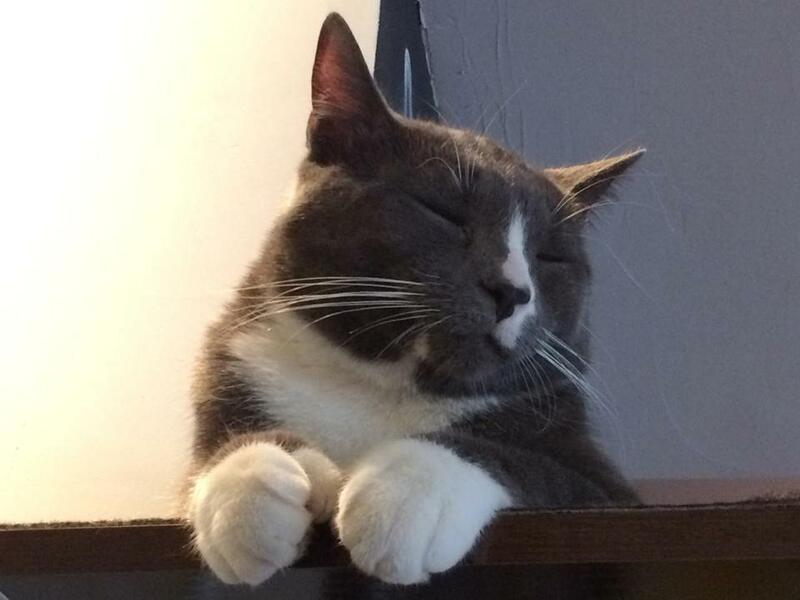 This little polydactyl charmer is a resident at Café Chat L’Heureux (the “Happy Cat Cafe” in English), which opened in Montreal last month. Café Chat L’Heureux and Cafe des Chats are the first two cat cafes in North America, and the cat ladies of Quebec have been quick to arrive. 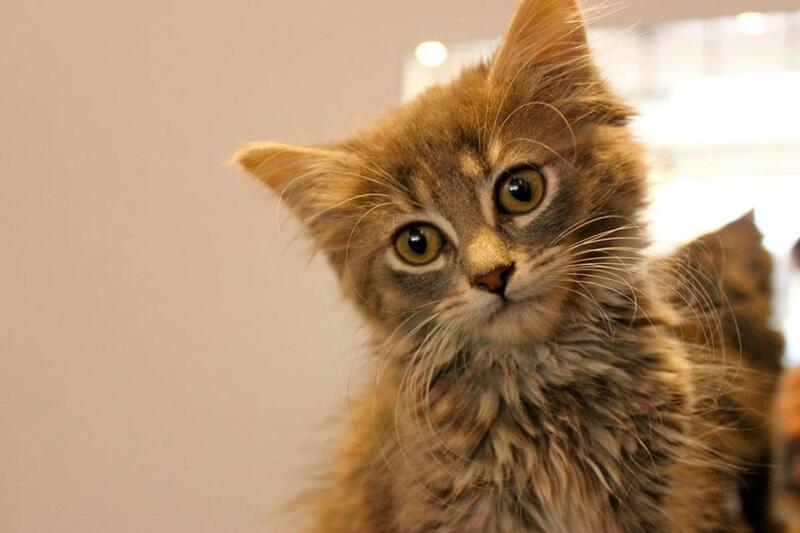 “Yes, you could say I’m a crazy cat lady,” said Montreal resident Rebecca Leclerc as her eyes darted between me and a fluffy little scamp of a kitten named Luna. It was evident that Leclerc would much rather be petting the adorable Luna, so I finished our conversation and let her go. Five minutes later, Luna was snuggling on Leclerc’s lap. For the uninitiated, or those not yet infected with toxoplasmosis, the cat cafe is a phenomenon that started in Asia in the late 1990s and is now taking over the rest of the planet. The concept is simple: You come for the coffee, and stay for the cats. At first it’s a bit jarring to walk into a restaurant filled with cats strolling about. Once you become accustomed to the adorableness of it all, you begin to wonder why every cafe doesn’t have an army of cats in residence. 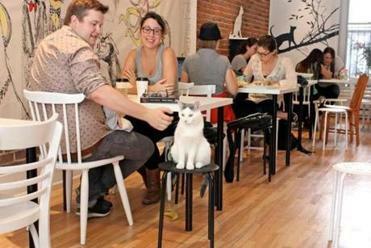 These cat cafes in Montreal are the first permanent ones in North America. Customers have an opportunity to play with cats, pet cats, and watch cats be aloof. Sorry people, you occasionally encounter a haughty cat. After success in Asia, the cats arrived in Europe en masse. Cafes opened in Austria, and have since spread across the continent. Favorite cat cafe names in Europe? Paws down it’s Pee Pees Katzencafe in Berlin, La Gatoteca in Madrid, and Lady Dinah’s Cat Emporium in London. Don’t even think of dropping by Lady Dinah’s without a reservation. London cats are fancy. Chopin lives at the Cafe Chat L’Heureux. The United States is not immune to cat power. More than a dozen catfés — don’t groan, I didn’t come up with the term — are currently trying to open here. It’s been a race to see who can open first (you won’t see one in Boston anytime soon), and it appears California will be the winner. Cat Town Cafe in Oakland is slated to welcome visitors this week. That’s all fine and dandy, but after years of not-so-patiently waiting to visit a cat cafe, I hoofed it to Montreal as soon as Cafe des Chats and Café Chat L’Heureux opened last month. As my friends can attest, I’m a crazy cat lady trapped in the body of a man. I spend my spare time dreaming up names for the dozens of cats that will one day fill my home: Chairman Meow, Mrs. Davenport, Lady Daintyfingers, the Countess Meowenger, Slacks, Dr. Princess, Edgar Allan Purr, Professor Ira Whiskerstein and his wife, Myrna Whiskerstein. There are more, but this is about Montreal and not my feline-filled future, so let’s get on with it. In Montreal, I felt as if I had landed in a giant litter box of happiness. My first stop was Café Chat L’Heureux to speak with owner Clement Marty. The transplanted Frenchman had noted the success of cafes in Asia, and decided that Montreal was ready for cats. He was right. A crowdfunding campaign to open the cafe raised $45,000 in 40 days. This kitten named Luna is a resident of Cafe Chat L’Heureux. It’s heartening to see the seven shelter cats (soon to be 10) enjoying new lives here. Conversations stop when cats walk by and people revert to baby talk to communicate with them. Do cats understand English and French better when they are spoken to like babies? The vegetarian menu here is fantastic, but there is no competing with the cats who play and snooze. When they get tired, or hungry, or bored with people, they have their own room where they can escape. It’s a similar scenario at Cafe des Chats. The cats roam about as if they own the place. I don’t think anyone has told them otherwise. The slogan is “Le chat est Roi!” (“The cat is king!”). 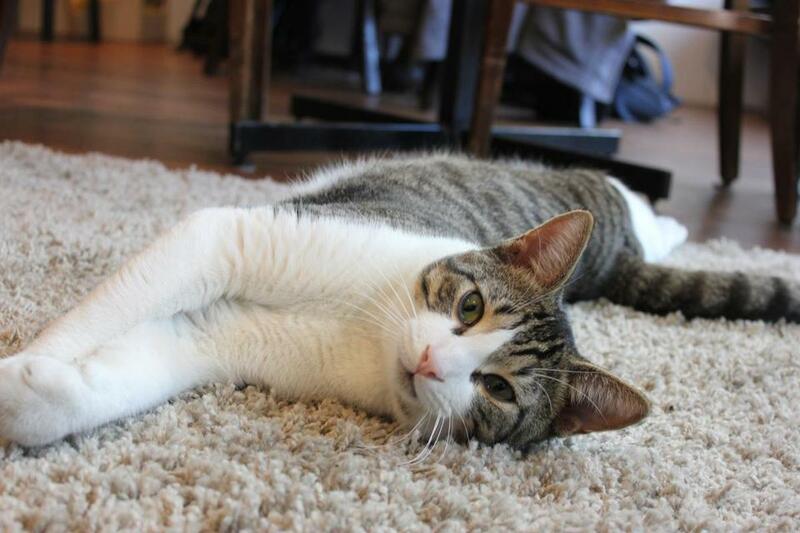 Cafe des Chats takes the title of first cat cafe in North America. The cafes allow for quality feline time without the responsibility of ownership. There are specific rules. You are not allowed to pick up the cats, disturb sleeping cats, or feed the cats. When you walk in, you are required to use hand sanitizer. Oddly, you’re not required to use it when you leave. Proving yet again that cats are more sanitary and superior to humans. The cats do not have access to the kitchens, meaning that pastries are not served with a side of hairballs. Gustave lives at Cafe Chat L’Heureux. At Cafe des Chats, I met Marc-Andre Ross and Christiane Pineault. Ross is allergic to cats, so he takes medication and comes to the cafe so his girlfriend can spend time with the cats. That is the definition of a good boyfriend. But most people I spoke with at the cat cafes have their own cats at home. Are these people cheating on their cats? It’s understandable why these places have exploded in popularity. Going to a cat cafe is not a solo experience. We are accustomed to sitting in coffee shops with our noses buried in laptops. But the purpose here is to bond with animals. What I experienced was strangers playing with cats and conversing about cats. It didn’t take long until phones were out and people were showing each other pictures of their cats. “This is Marie Purie,” said Julien Girard, a slightly eccentric fellow who showed me a picture on his phone of a black and white cat wearing a jeweled collar. The conversation trailed off as he rubbed a cat named Sheldon’s chin. As novel as these cafes seem, they appear to be filling an important need. 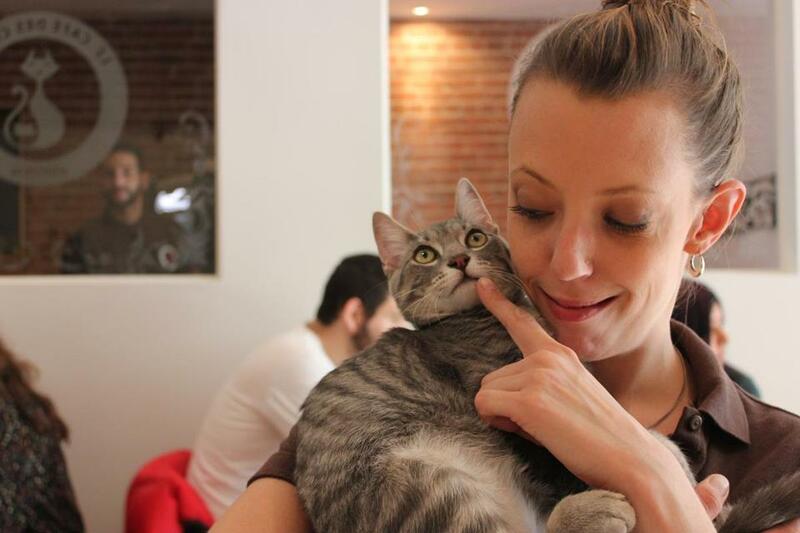 Some people at the Montreal cat cafes were forming bonds with the cats. I left feeling like I had made many new feline friends. And although they would probably be loath to admit it, I think the cats were enjoying their human time just as much.